Aquatic Life T5 HO Hybrid 4-Lamp Mounting System Fixture. Available in 24", 36" & 48" lengths for 18-24" wide (front to back) aquariums. Universal mounts included for EcoTech Radion (TM), Kessil 360 (TM), and AI Hydra & AI Prime (TM) LED Fixtures. This new mounting system with T5 HO lamp housings is for use with the Kessil 360, EcoTech Radion and AquaIllumination Prime LED fixtures, and includes universal mounting brackets to install them into the fixture. Suspension hardware included - lamps, mounting arms and LED fixtures NOT included. Features: HEP (TM) Brand ballasts drive all T5 HO lamps, including popular ATI (TM) and Giesemann (TM); Silicone socket lamp endcaps protect pins of T5 HO lamps from moisture and salt creep; Reflector design keeps light output focused inside the aquarium. Got this for the Red Sea Peninsula 650 that I am setting up and will be using it with my Kessil's. I love the look of the fixture but wish both T5 power wires were on the same side to make it easier for people with peninsula tanks to hide wires. I also have the 36 inch version for my 65 gallon. 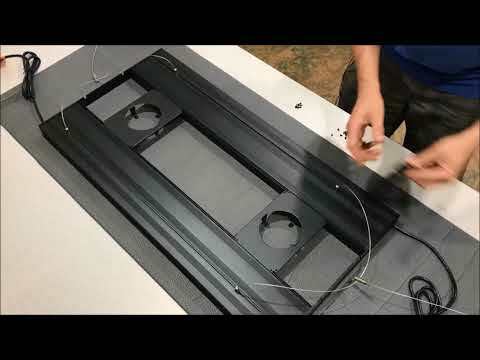 Here's a video of me putting it together which was super easy.